What is WUULF? It’s a week-long intergenerational summer camp, it’s a spiritual retreat for religious liberals, it’s a chance to spend a week in a remote section of Northern New Mexico among the orange mesas and box canyons of the desert wilderness. But mostly it’s just FUN! About 125 people attend WUULF every year, mostly from around the Southwest but some from as far away as New York State. One of the biggest contingents is always from High Plains UU Church in Colorado Springs. Many of the attendees are “regulars”–folks who come back year after year. Our first year at WUULF, we were a little intimidated by the fact that everyone else seemed to know each other. Our second year, it felt like WE knew almost everyone! Imagine a week of being surrounded by people who are open to you and your ideas. Someone else does the cooking. You sleep in rustic motel-like accommodations, or you camp in a campground with hot showers and unlimited FREE ice (now THAT’S luxury!). There’s happy hour every afternoon. You can attend lectures, book discussions, poetry workshops. You can swim, make music, and do yoga. You can climb the dramatic Mt. Pedernal, which overlooks Ghost Ranch. You can hole up in the library, which is open 24 hours a day. You can celebrate the summer solstice in a moving ceremony held at a stunning natural amphitheater. You can hike on spectacular trails uncharted by the US Forest Service. You can take a nap whenever you feel like it. You can tour Georgia O’Keeffe’s former home in nearby Abiquiu, and you can take a whitewater (if there IS water . . .) rafting trip on a local river. If you brought children, they are off happily being supervised by a WUULF staff member every other day. If you brought a teenager, he or she might be preparing for the landmark coming of age ceremony at week’s end. You can make some new friends, or you can make friends with someone you see every week at church but somehow never find the time to talk to. And the best part about this rich and varied list of activities? Everything on it is OPTIONAL! You can do what you feel like doing, or you can do nothing at all! They have phones at Ghost Ranch, and a room full of computer terminals where you can check your e-mail. But after the first day or two, caught up in the magic of WUULF, I pretty much lose the desire to engage in electronic communication with the “outside” world. If I really want to tell someone something, I can always curl up in a chair under the big tree outside the main building and write them a letter! You don’t have to be a UU to go to WUULF. You just have to be open to a week of relaxation, connection, and growth. If you have children, you just have to be prepared to give them a lifetime of happy summer memories. For at Ghost Ranch, individual families fade away and a tremendous sense of community develops. Children and youth become the focus of everyone’s devotion and attention. Kids learn that they are valued and cared for. But the evenings are filled with community and fun. There are square dances, hootenannies, To Tell The Truth games, talent show, solstice drummings, and campfire sing-alongs. The teens and adults participate in an affirming Coming of Age ceremony. So, it you think that the feel of the small town, the lure of the front porch, and the majesty of being outdoors on summer nights disappeared with the 1940’s, think again. It still exists. You can find it about 6 hours away in northern New Mexico. You can find it among the Village People of Ghost Ranch. Ghost Ranch is indeed a holy place. The Village People help to make it so. High Plains Church is also a holy place. It is my dream that our people become Village People as well, and in turn, learn the lessons of Ghost Ranch. My parents got divorced when I was about 12 years old. I say “about 12” because to be honest, I really don’t know how old I was when it actually happened. All I remember was that between 5th grade and 9th grade, I come home from school everyday and listen to my parents fight for hours. Sometime in that five-year blur of domestic hostilities my parents actually got divorced. School wasn’t a safe place either. Every day I would go to school and be picked on by nearly every student in my grade. Life was pretty bleak. But at the time, that’s just the way that life was, I had never known any different, so I had no “fairy tale life” to compare my own to. I just had to learn to survive on my own, without the help of any friends or family. The world was a hideous and dark place where people showed affection through violence and hatred. And I’ll be honest with you, I considered myself lucky. Why lucky? Because about the time my parents’ marriage started falling apart, my mother started bringing me and my sister to Ghost Ranch, New Mexico. We came every year for what was then called M.D.D.F.F. (Mountain Desert District Family Festival). It was a truly spiritual experience. For the first time in my life, there were children around me who were trying to get to know me, rather than trying to throw things at me. For the first time in my life, I was around adults who took time to take me aside and see if I was all right. I was shocked. That single week had shown me a glimpse into the world that I had never envisioned before. Here was a place where people could all come together and join in each other’s lives in a sense of joy and wonder. Here was a place where people could trust each other, and where nobody was interested in beating up their spouses, or picking on the small quiet children in the back of the room. Going home from New Mexico that first year, I don’t think I said a single word I just sat there in a daze, not understanding why the “real world” had to be such a dark place if it was possible to create a place that had a true sense of community. The following years at Ghost Ranch changed my life each time. The adult couple that ran the teen group became my surrogate parents. When I was 18 and was graduating from the YRUU program at my church, they stood in for my parents during the ceremony. When I thanked them for doing so, they said it was their honor to do it. I’ll never forget how I started crying so suddenly. When I was in 8th grade I met a girl at Ghost Ranch named Sara. That was the first time in my life that a girl had actually had a crush on me, and I on her. Neither of us knew what to do about it, but she lived in Nebraska, and I lived in Denver. So we just wrote a lot of letters to each other over the next 2 years. Sara and I remain good friends today. As a Ghost Ranch teen, I went through the “changing ceremony”, a rite of passage into adulthood. After that afternoon in a sweat lodge, my mother no longer treated me as a child, but as the man of the house. It was a turning point in my becoming an adult. The group of friends I made and hung out with every year at Ghost Ranch are today the best friends I’ve ever had. In addition to Sara who is currently living in the Czech Republic, I made friends from as far away as Olympia, Washington and Baton Rouge, Louisiana. These are some of the most important people in my life. Our lives are bonded in a way that is virtually lost in the modern world. Modern American society has no sense of community, no sense of the sacred. Such a society can be a very dark place at times. But places like Ghost Ranch remind me that it doesn’t have to be such a dark place after all. 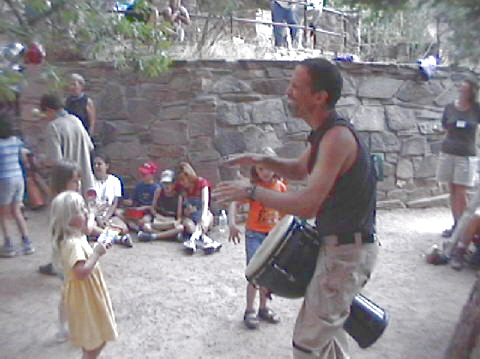 This was my 10th year at Ghost Ranch. If I go every year for the next 42 years, I’ll have spent a year of my life there. It will have been one of the best years of my life.